This release was originally titled “Death To America”. It was first scheduled to be recorded starting September 11, 2001, at New Alliance Studios in Boston. Recording was pushed back to 3 days in November, 2001, with the final recording finished over 3 days in February, 2002. Over 6 days in the studio, the band finished 29 tracks, including covers and outtakes. The band, with the expertise of engineer/producer Andrew Schneider (Blue Man Group, Cave In, Scissorfight, TREE) exploded every track to its most distorted form. Drawing from influences of neo-classic Japanese sonic assaults such as the Mainliner’s masterpiece ‘MAINLINERSONIC’, High Rise – ‘Desperado’, Boris – ‘Amplifier Worship’ and the stereo-attack of MERZBOW and MASONNA, along with a myriad of domestic influences ranging from Negative Approach, Melvins and early Husker Du, to the visceral pop songs of Neutral Milk Hotel…Milligram pushed for memorable choruses amid the degenerated blasts of drums, guitars and vocals all pushed hard through glowing tubes, until they were deep into the red. 14 songs from THIS IS CLASS WAR were originally released in a limited pressing of 300 hand-stamped CDRs, sewn completely into cloth camoflage sleeves, with hand stamped, hand numbered digipaks, on TRAKTOR7. The Small Stone version contains more than 30 minutes of additional music, including most of the outtakes, some remixes (drums and vox only, to illustrate that a majority of the distortion is on the drums) plus tracks of the ambient/noise (generated on a Mac G3/266, in SoundEdit) that used to be played before and during Milligram live sets. from the US airwaves for “lewdness”. Three unused songs from the sessions for THIS IS CLASS WAR. 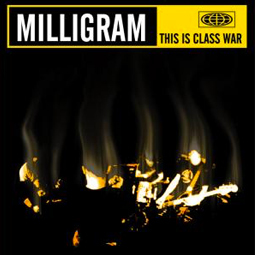 Milligram covers songs by The Dwarves, and Motorhead. The third song is an outtake.